THIS five-star houseboat comes with a private chef and bathtub with river views. Fairy lights on Buddhist temples, road-side fish markets, stray dogs and tuks-tuks on dusty roads – arriving big in Sri Lanka was a thrilling blur. The streets are a hectic muddle of men and women wrapped in colourful robes, weaving in and out as children play at their feet. Boney cows casually stop for naps in the middle of the road and eateries line the streets filled with deep fried, spicy snacks and juicy chickens cooking on rotisseries. Our luxury houseboat on the other hand is the exact opposite – a tranquil paradise tucked away from the hustle and bustle. Yathra by Jetwing is a old rice barge, converted into a five-star floating hotel on the Bentota River, on Sri Lanka’s southwest coast. The private boathouse is kitted out with a plush double bed, small lounge and a bathroom – which features a tub with river views. A table and chairs sits at the bow of the boat offering a perfect spot for on-board meals and the top deck has been transformed into a sunbathing terrace with comfy sofas and sun beds. The area surrounding the boat is breathtaking. Lush green palms touch the waters edge and crocodiles lurk on muddy banks as locals fish nearby. Three staff members man the boat – the chef, the captain and his right-hand man. On our first afternoon, the crew sailed the boat along the Bentota River as the burnt orange sun began to set behind the silhouetted palm trees. The mossy green water transcended into a smooth sheet of silver as we sipped Lion beers and hundreds of fruit bats flew above our heads. Because if its remote location, the boathouse is the perfect spot for stargazing. When the sun goes down, the sky erupts into a sparkling masterpiece. With no light pollution nearby, the Milky Way glistens like a rainbow of stardust arching over the sky. In the morning the chef prepares a breakfast of lentil dhal, fresh fruit, fish curry and coconut roti (a Sri Lankan flatbread). We ate it overlooking the winding waterways and it was one of the best meals of my life – spicy, flavourful, delicious. Food is always a big part of a holiday for me and the meals were so amazing onboard I barely felt the need to search out local restaurants. 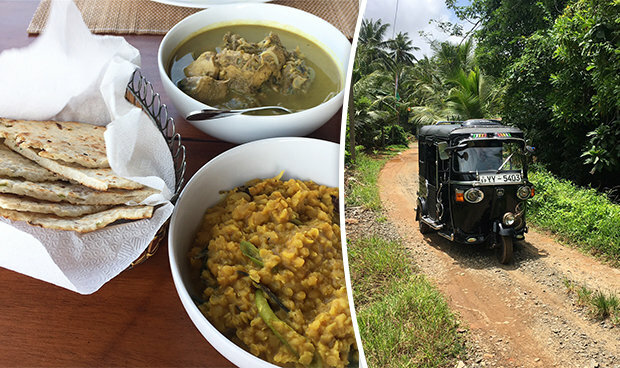 Yathra is moored close to Bentota Town and beach and there is a pimped-out tuk-tuk onsite, which guests can use to explore the area. In just one day our friendly driver took us to ancient Buddhist temples, stunning gardens and a turtle sanctuary on the beach. After multiple recommendations we also went to Amal Villa for lunch. Situated right on the beach, the eatery specialises in fresh seafood. You can even pick your own crab, lobster or fish. I opted for the coconut crab curry – messy but absolutely delicious. After lunch we headed to an ancient Buddhist temple called Galapatha Raja Maha Vihara. The 2,500-year-old temple doesn’t look like much from outside – a white domed building with a few intricate doorways – but inside the carvings are truly spectacular. In the main room a giant reclining Buddha is stretched out on a bed surrounded by gold carvings and food and flower offerings. We then moved on to the Benton Turtle Sanctuary, where we got to see green, leatherback and olive ridley turtles. They even have a completely white albino sea turtle called Michael Jackson.We only had three days to explore Sri Lanka, but Bentota – which is just a few hours from Colombo airport – was a great introduction to the country. 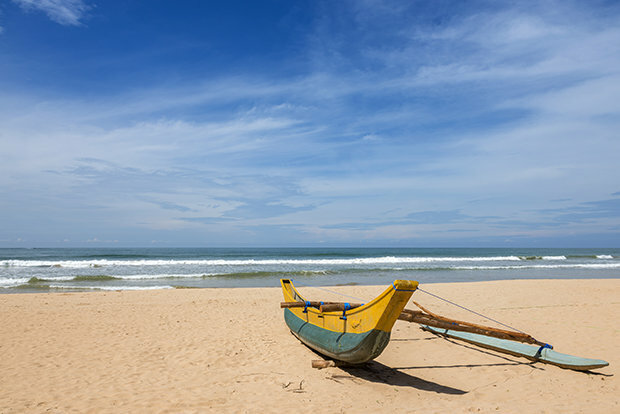 Sri Lanka has just been voted Asia’s Leading Destination at the World Travel Awards and it’s easy to see why. The country really has it all – you can go on safari to see leopards and elephants, you can spot blue whales off of the south coast, the food is fantastic and the historic, ancient temples are breathtaking.I will definitely be going back to explore more of the county’s delights as soon as physically possible.